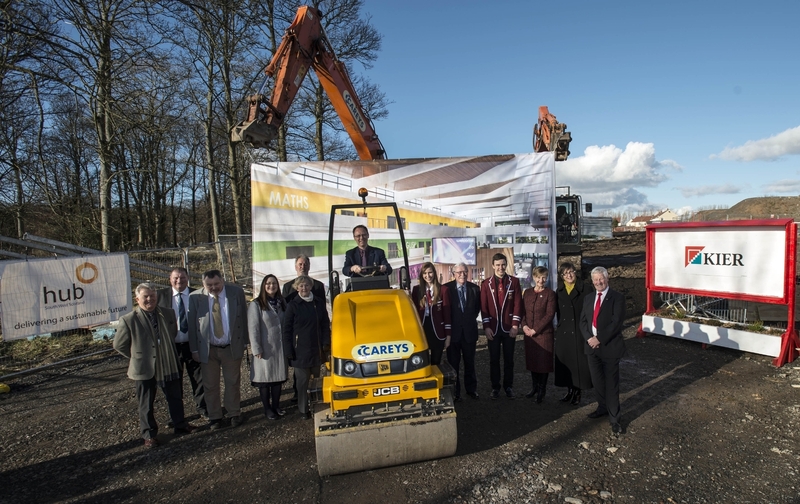 Construction work at the new Ayr Academy Learning Campus is now officially underway. The £25 million project, funded by South Ayrshire Council through the Scottish Government's Scotland’s Schools for the Future programme, is set to open in August 2017. The project will be delivered by hub South West, set up in conjunction with the Scottish Future’s Trust and other partner organisations, to deliver major public sector building projects. 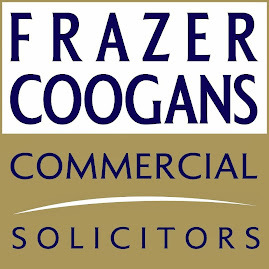 Building works will be undertaken by Kier Construction. The new Ayr Academy, which will have capacity for up to 1,000 pupils at Ayr’s Craigie Estate, also incorporates sports and community facilities including sports pitches, a multi-use hall, two gyms and a dance studio. Minister for Learning, Science & Scotland's Languages, Dr Alasdair Allan, visited the site on Tuesday February 23 to mark the start of the construction process. He said the project was among the best in the country. “I’m pleased to see work moving ahead on a project that will provide the local community with a first-class facility. “Today marks an exciting milestone for the new Ayr Academy and I’m delighted the Scottish Government could provide around £18 million towards the project. 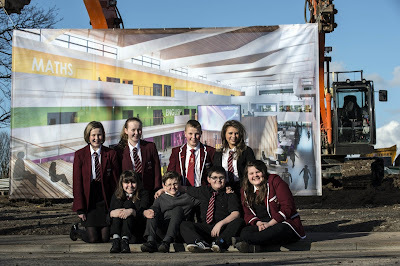 Councillor Margaret Toner, South Ayrshire Council’s Portfolio Holder for Lifelong Learning, said: “It’s great to see work getting underway to realise this fantastic new campus, a project that will transform the quality of education for a generation of pupils. “In the next eighteen months people will see real progress as the project starts to take shape, and at the same time we’ll be working closely with pupils so that they know exactly what to expect when they get here. Brian McQuade, managing director of Kier Construction's Scotland & north-east England business said: “Education is one of the areas we specialise in and we have a proven track record in delivering similar projects in the sector; Kier Construction builds and refurbishes more than 200,000sq m of accommodation each year, which provides an average of 25,000 school places. “The delivery of this project will require around 200 people working on site at its peak, which means it’s an important scheme for South Ayrshire’s economy, creating valuable employment and training opportunities in our local supply chain. Michael McBrearty, Chief Executive of delivery partner hub South West added: “We enjoy a close working relationship with South Ayrshire Council, with the new campus being our sixth joint project. “Our model helps deliver projects like Ayr Academy over relatively short periods, something that highlights the versatility of using the hub approach for public sector contracts. Professor Malcolm Foley, Vice-Principal & Pro Vice-Chancellor (Engagement), and Dean of the School of Business & Enterprise at University of the West of Scotland, said, “UWS is proud to be at the heart of education, culture, and business development in Ayrshire. 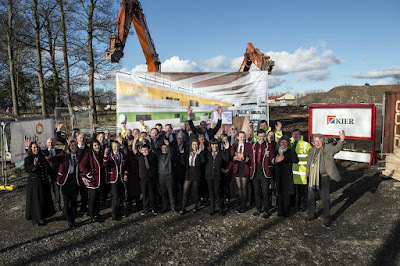 The Ayr Academy Learning Campus will be constructed on a Design, Build, Finance and Maintain (DBFM) basis. This takes account of both the construction of the new school and facilities, as well as a 25-year maintenance contract, which has been awarded to FES Ltd for maintenance of the building fabric, external and built internal environment. All other facilities management, including cleaning, catering and janitorial services will remain with South Ayrshire Council. The Council will fund the revenue cost of the facilities management contract as well as lifecycle operation costs – for example, the replacement of boilers, windows, roofs etc. The DBFM model for the Ayr Academy project – as well as 11 other projects across Scotland being constructed on the same basis – was revised by the Scottish Futures Trust to take account of ESA10 (European System of Accounts 2010), which determine how national governments report overall levels of debt in the national accounts. Ayr Academy is the first of these projects to reach financial close since the Deputy First Minister confirmed the revised model and advised the projects could proceed on 26 November 2015.